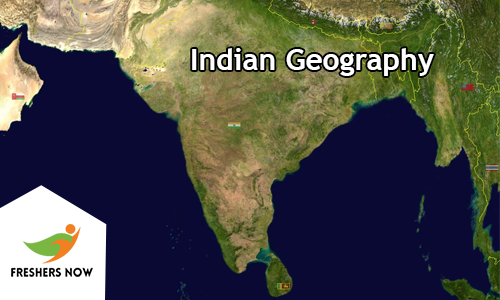 Indian Geography Quiz: Are you curious to learn about Indian Geography topics? Then take the Indian Geography GK Online Test from here. Candidates may get frustrated in surfing various websites, referring many books related to Indian Geography, then don’t worry, we are here you, by providing the Indian Geography Quiz. Moreover, in this post, we are offering the Indian Geography Online Test which contains various questions that are useful for every candidate to face multiple competitive exams. And it plays a prominent role in one’s career. So, to overcome the difficulties in those competitive exams, this post we have arranged the Indian Geography GK Questions and Answers. 1. Which major latitude passes at the south of the southernmost point of peninsular India, that is Kanyakumari? 2. Is Guwahati situated on the banks of the river? 3. In which position Earth moves around the Sun? 4. Which is the smallest (in area) of the following Union Territories? 5. Which of the following rivers does not flow into the Arabian Sea? 7. Which of the following geographical term related with the ''piece of sub-continental land that is surrounded by water''? 8. Which of the following pass has been created by the Indus River? 10. The principal copper deposits of India lie in which of the following places? 15. Which one of the major source of irrigation in India? 18. Which Rivers are flowing in South Odisha and North Andhra Pradesh Coast? 19. By volume in which number Earth come in respect of other planet? 20. India and Sri Lanka are separated by the ___ strait. 21. Which city is known as the 'Queen of the Arabian Sea'? 24. Which one of the following is known as the pearl city? Political Geography: India is a land of 29 different states, six union territories, and 1 National capital territory. The most populous state of India is Uttar Pradesh. Jammu and Kashmir is the beautiful state in the country. India as seven union territories. Delhi is the capital of India. The Line of Control (LOC) is the border of both India and Pakistan. With the help of this page, you can quickly learn the illustration of the concept Indian Geography. This post also helps you for better improvement of your answers even by practicing more times as you can. Through this Indian Geography Quiz, you can understand more about the topic through the explanations provided. This Quiz is like a mock online test which helps in the erection of the confidence in one’s careers. As the time is allocated for all questions given in Indian Geography Online Test, the results are awarded as well. It provides an appropriate explanation for every question. By going through this Indian Geography quiz, every candidate can face their competitive exam. Therefore, we hope that after taking the Indian Geography Quiz, competitors can improve their skills. Also, aspirants can come to this page regularly and retake the Indian Geography Online Test. Visit our website freshersnow.com on a daily basis.